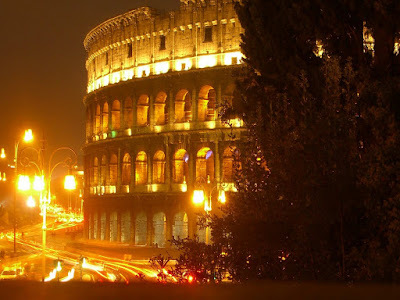 Of all the cities we visited on our trip to Italy, I was most excited about Roma. 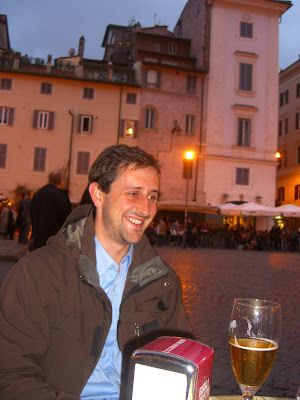 I had spent a few weeks in the city a few years ago with Roman friends. While mostly I enjoy the thrill of visiting new places, lately I’ve realized the merits of visiting one place again and again. On the first trip you can get all of the must-see stuff out of the way in a touristic whirlwind, but on successive trips you can let yourself relax and just let the vibe of the place slowly seep in. We decided to begin our time in Rome feasting like, well, like Roman emperors. Of all Italian regional cuisines I’m most passionate and knowledgeable about Roman food, so we prepared ourselves for four days of gluttony and indulgence! After this first night’s meal at Matricianella, Phil’s mom Laurie said traveling with us is like an endurance test. I think she was referring to her belly. 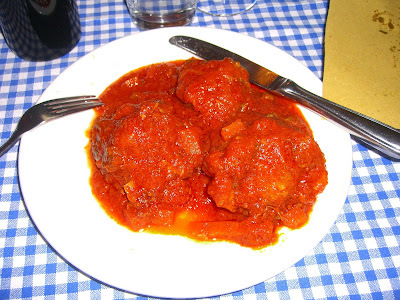 Matricianella is a popular spot with both locals and tourists alike that serves classic Roman cuisine. Although we had a reservation (which by the way is essential here), we weren’t able to snag one of the outdoor tables lining the street. Nevertheless, the inside dining rooms were very cozy, with checkered tablecloths and wooden fixtures, most notably the wood beam ceiling. I think it’s safe to say that the wine “list” at Matricianella was one of the most impressive I’ve come across. 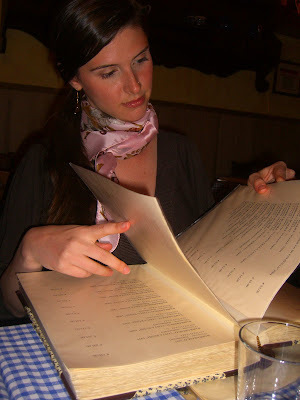 The wine “list” wasn’t really a list at all – more like a Bible-length tome. It was overwhelming to say the least, but we chose a 2005 Madreselva for extremely oenological reasons: because our Madre, Laurie, was traipsing around Italy with us, and because she lives on a street that’s called Selva something-or-other. The menu offers a comprehensive sampling of Roman cuisine, and boy we tried a lot of it. I am a sucker for fried food and the Romans really are experts in the art of frying. They love to fry up wonderful things like brains and testicles but I thought Phil and Laurie should be eased into trying those sorts of delicacies. 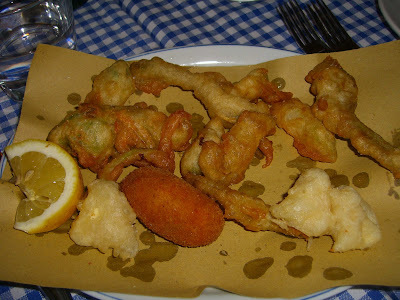 So instead we ordered a fritto misto of zucchini flowers stuffed with mozzarella, Romanesco broccoli (a spiky broccoflower, cross between broccoli and cauliflower), potato croquettes, bacalao (salt cod), and mozzarella. GUESS WHO IS HAPPY??!!! 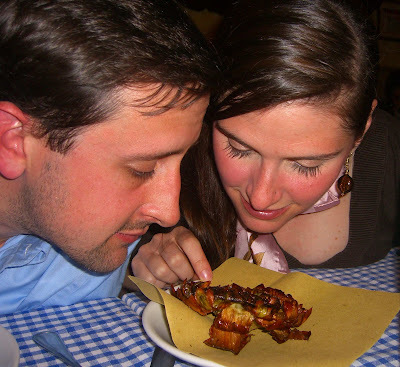 We also couldn’t pass up trying the carciofi all giuda, Jewish-style artichokes. Although these are best sampled in restaurants of the Jewish ghetto, these artichokes are one of my favorites and I certainly wasn’t patient enough to wait until we made it to the ghetto. Jewish Romans have a knack for choosing the perfect small, tender artichokes for this dish. Cooks continuously turn the artichokes as they dexterously trim and crush them so the leaves open like a flower. Then they fry the artichokes so they maintain their flower shape and become crispy. After our fried food extravaganza, we each ordered a first course. My spaghetti cacao e pepe, or cheese and pepper spaghetti, is the best proof that simple preparations are often the most exquisite. 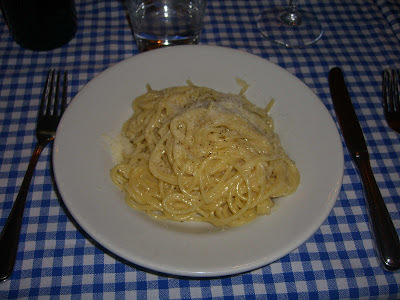 The dish is quite simply pasta dressed with the water it was cooked in and an abundance of parmigiano cheese and freshly cracked black peppercorns. Laurie’s rigatoni with bacon and white wine was equally simple and satisfying. 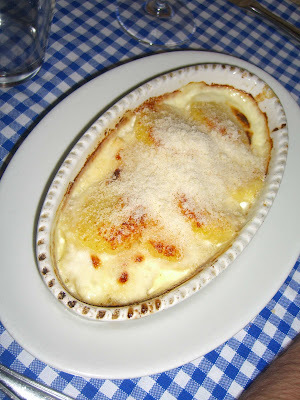 Phil’s gnocchi alla romana stole the show and was certainly one of the best dishes of the night. The gnocchi themselves were impossibly tender and really did melt in your mouth. Yet somehow they managed to stand up to their cheesy béchamel blanket and retain their delicate texture after they’d been baked. At this point I must admit that the fried antipasti and first courses ended up being the highlights of our dinner at Matricianella. This confirms my theory that Romans are the undisputed masters of fried goodies and pastas! Of all our main courses, my coda alla vaccinara stood out as being the most flavorful and well-prepared. I am sure it benefited from being made earlier in the day or even the night before, as the flavors were well developed. 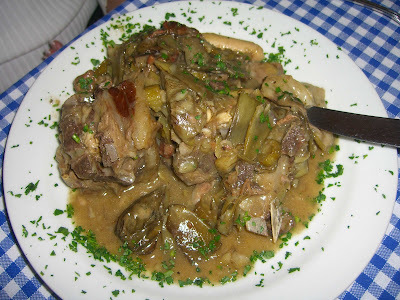 The dish is essentially slow-braised oxtail in a tomato-based sauce. 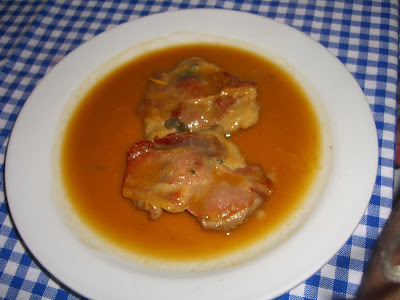 Phil’s saltimbocca alla romana was good, but didn’t impress him. I think it was just impossible to live up to that gnocchi! Plus, I often prepare a similar dish of thinly pounded veal, prosciutto, and sage in a Marsala wine sauce for quick dinners at home, so this dish was less special than something he doesn’t often eat. Laurie was very pleased with her braised lamb with artichokes and roasted potatoes and found herself cleaning lamb bones with her fingers. 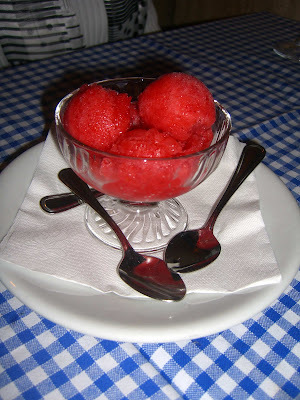 After such an epic meal, a simple dessert of strawberry sorbet was wonderfully refreshing. 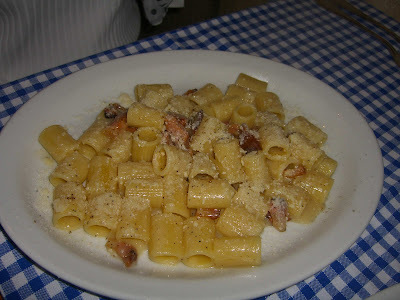 If you’re looking for traditional Roman food done well, Matricianella is your place. We topped off the night with a drink near our hotel in Campo de Fiore, and yes we did sleep very well!